Sonos finds some missing oomph with its Sub wireless subwoofer, a potent box of boom to round out the bottom of end of your Sonos system, no wires needed. For all of the quality, flexibility and whole-home hotness that goes into Sonos’ wireless speakers, there was always something missing: bass. Not in absolute terms, mind you, since Sonos’ speakers have always had relatively good bass performance, especially for their compact sizes. But, given the constraints of that pesky little thing called physics, small speakers can only go so low and so loud in the nether regions. Sonos seems to have recognized this fact and now has a subwoofer to go along with its array of wireless speakers and components, which they’ve simply called the Sub. We dig deeper into its design and performance capabilities to see if it delivers. The Sonos Sub certainly doesn’t look like any other subwoofer we’ve seen. We thought its unique, squared-off “O” shape was a refreshing change from the typical big ‘n bulky, fridge-sized subs we’ve grown accustomed to over the years. Its smooth, gloss-black finish and contoured edges felt nice to the touch, and we couldn’t resist running our hands over the two opposing, racetrack-shaped woofer faces exposed inside the center of the “O.” Be forewarned though when you’re unboxing it for the first time: At 36 lbs. and with outer dimensions of 15.8 x 6.2 x 15 (W x H x D, in inches), the Sub is deceptively heavy for such a compact design. Other items included inside the box were a quick setup guide, user manual, stick-on protective felt pads and a power cord. 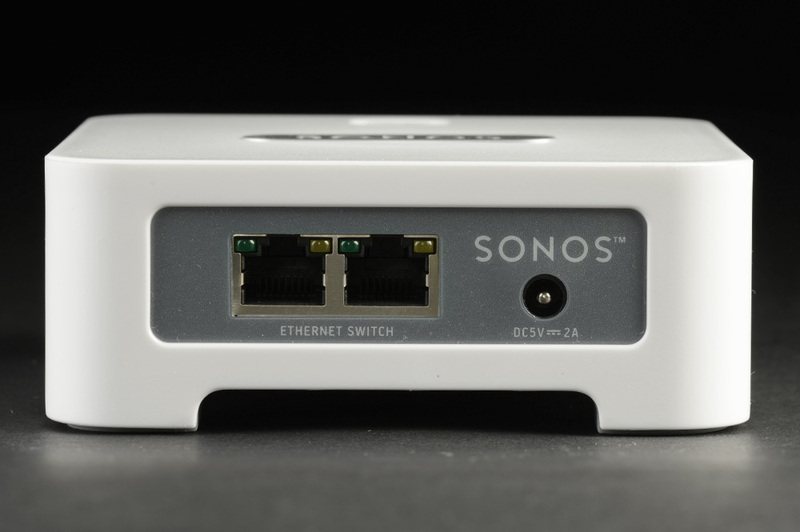 The Sonos Sub reveals doesn’t have any visible inputs to speak of, except for an Ethernet port on the bottom. 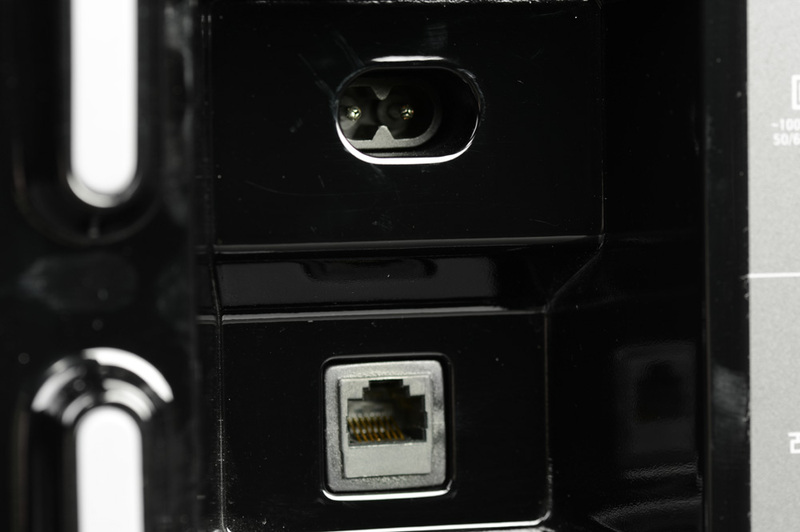 This port allows the sub to offer an Internet connection to another component, such as your set-top box or gaming console, should you need a handy way of stringing along another Internet-enabled device. 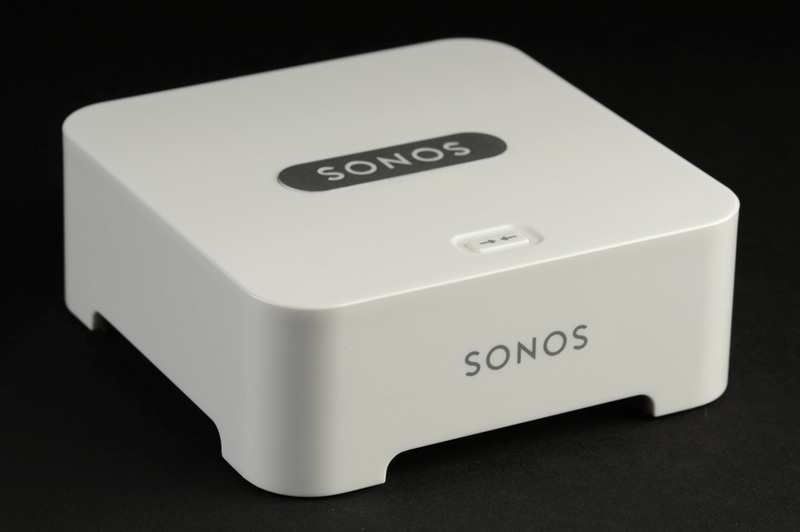 One conspicuous absence from the Sonos Sub is any sort of standard connection jack: It’s an exclusively wireless component, and it’s designed to work only with other Sonos equipment. Speaking of which, Sonos does mention that the Sub works with all amplified Sonos components from all generations, except for Connect/Zoneplayers 80 and 90. 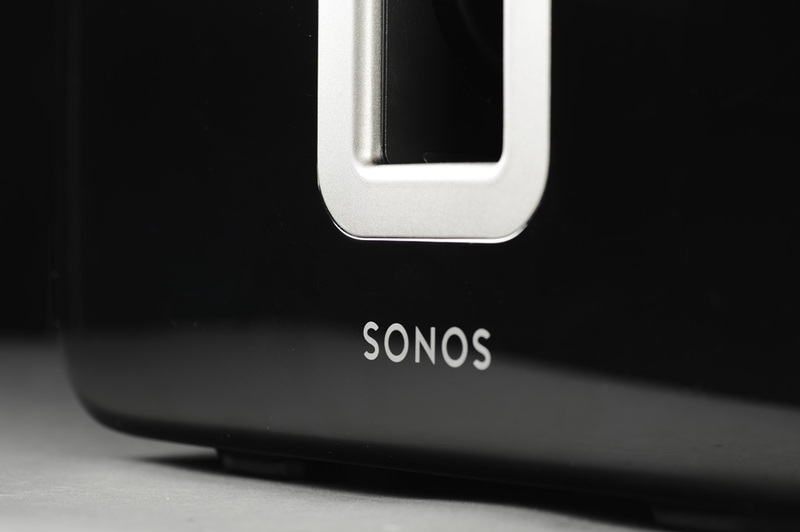 We kind of missed those RCA jacks as it eliminated the possibility of any direct comparisons to other subs, but everyday Sonos users of course will have no issues with the lack of a jack. The Sub does have some other practical features, such as its placement-versatile design. You can position it like a traditional sub for example, standing up and placed in a corner, or laid down flat and tucked under or next to a couch. Sonos also utilizes a force-cancelling design for those aforementioned opposing woofers, which is said to virtually eliminate unwanted vibrations from the cabinet. Other features include two class-D amplifiers (power rating not specified), internal DSP-controlled calibration circuitry, and single-button setup. The enclosure is made out of a dense, resin-like material instead of the more traditional MDF, which is largely responsible for the Sub’s overall heft and solid feel. We started our set up by first connecting the Bridge to our computer network’s Wi-Fi router, then booting up the included disc on our laptop and following a series of prompts in the instructions. Once the software is installed on your computer, a peer-to-peer wireless “mesh” network is setup between your computer and the Bridge, connecting with the music files stored on your computer or network drive. You then add your Sonos amplified components to the network by following the instructions on your computer or controller device, followed by a simple push of a button on your Sonos components to be added. Once we added the Sub to our Sonos network, all that was left was calibrating it. This is done by listening to a scalar test tone type of sound being played through the subwoofer and associated speakers listening for the louder of two comparison signals. You then select the best volume blend between the Sub and the speakers. The internal DSP then adjusts and manages all filtration, active EQ and time alignment settings. The whole process from setup to playback readiness took us less than 5 minutes. After setting up the Sub, we decided to just let ‘er rip with as much bass-heavy music as it could handle. The Sub immediately responded with some surprisingly tight, deep, and tactile bass. We could feel the low bass notes from Kanye West’s album 808s and Heartbreaks and D’Angelo’s classic Voodoo resonating throughout our room, and never did it sound the least bit mushy, slow, or overbearing. Occasionally we could hear a thumpy midbass emphasis, but this seemed to be more a product of where in the room we positioned the subwoofer. Speaking of placement, we were impressed with how well the Sonos subwoofer worked in a variety of locations. We tried it in a corner, along several points at both long and short walls, and under or next to our couch, and it produced consistently satisfying bass every time. Of course, the Sub responded favorably to optimized positioning within the room like any subwoofer, but unlike those many others, it wasn’t super finicky about it. In our room, we preferred placing the sub directly under the couch for the most impact, but of course your results and preferences may vary. Perhaps what’s most impressive however was how well the Sub blended with the Play:3 speakers we had on hand. The potent little Sonos sub created a perfectly seamless sound every time, even with music that constantly moved from bass to midrange notes, such as some classical piano and cello pieces. Many high end, multi-way speaker systems could learn a thing or two from how coherently the Sonos sub integrated with its partnering speakers. We continued testing the Sub will all different kinds of music, from classical pipe organ to jazz, and even to some electronica as well. We spun up Deadmau5’ latest album, >album title goes here<, for some really big bass grins, and we were mightily impressed by the pounding, driving bass beats pulsating through our body. If we listened for it, we could tell that the Sub’s claimed low end response of 25Hz was highly optimistic, but the quality of bass that was reproduced consistently sounded awesome for such a small subwoofer. The Sonos Sub always kept its composure, even at ear-blistering volumes, and it always maintained excellent pitch clarity and definition while delivering plenty of oomph when called for. We should also mention we never had any drop outs or signal issues with the Sonos Sub. It always stayed locked in perfect step with the music, without any noticeable lags or sync problems. Even when our ancient Dell Latitude D810 computer would occasionally have its own, non Sonos-related operational hiccups, the Sub started back up on cue every time without fail. Considering all that it offers, we can heartily recommend the Sonos Sub. And yeah, we realize that, at $699, it ain’t cheap. But no other sub that we’re aware of combines such a small form factor with this kind of potent, high-quality bass in one heck of an aesthetically pleasing package. Add in the seamless sonic integration, its placement flexibility, and its consistently rock-solid, bullet-proof operation, and the Sub becomes a no brainer for anyone looking to take their Sonos system to the next level. If you have always loved your Sonos system but craved moss bass, here’s your chance.